The Redwood Empire has had an amazing tradition of top notch girls distance runners and now with the realignments we may have one more. Vintage sophomore Mary Deeik was a Division II state qualifier from the Sac-Joaquin Section last year as a freshman. Vintage is coached by Brian Pruyn who won the 1995 Viking Opener, running for Vintage, in 10:03 and went on to place 27th at STATE in Div. II. 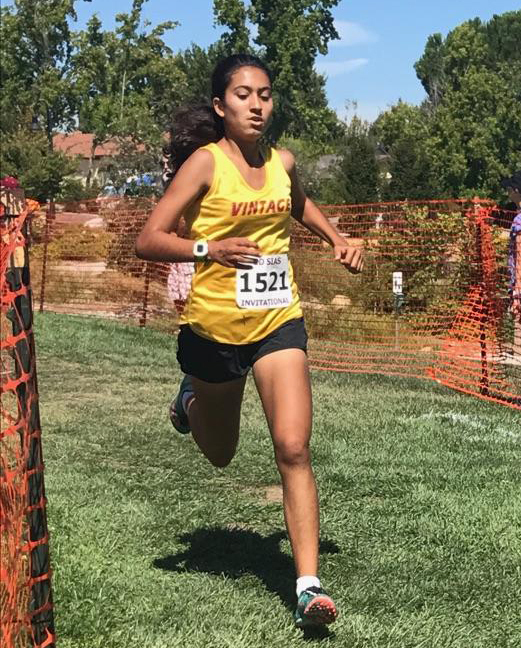 Vintage is in the new Vine Valley Athletic League with Petaluma, Casa Grande, Sonoma Valley and other Napa schools. This year Mary ran an excellent second in the Girls’ Varsity LARGE SCHOOL LIMITED race at Ed Sias. Saturday you can see how she stacks up with some outstanding runners at the Viking Opener at Spring Lake Saturday. First race is at 8:35am with the Frosh/Soph Girls, including Mary, taking off at 9:20. You had great runs at Ed Sias what are your thoughts on how the race went for you? I thought the race went well. I enjoyed running in this challenging course for the first time. The Redwood Empire is excited about adding runners of your caliber. What are your feelings about the new league you will be joining? I am excited to compete with many good runners in our new league. I started running in middle school and slowly grew into the sport. I like the mental toughness and the discipline part of it. To push myself to become the best possible runner that I can be in my sophomore year. Outside of running what are your interests? I play soccer and hang out with my family and friends.